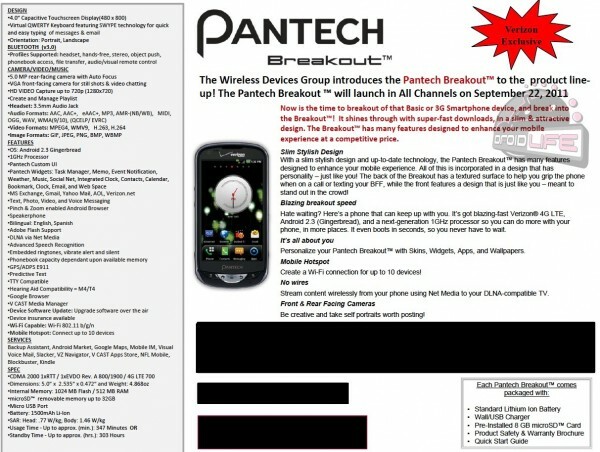 The Pantech Breakout is Verizon’s next 4G LTE phone to follow the DROID Bionic and is looking like the option for anyone interested in having high data speeds without having to pay upwards of $300 up front. We gave you a quick preview of the specs on this phone a few weeks back, but now have the full and official spec sheet to tighten up any loose ends. The Breakout won’t blow you away in this day and age with its hardware – I’m not sure it was built for that though. At some point, Verizon was going to have to offer affordable 4G LTE phones and this looks like it will be the first. With its 1GHz single-core processor, front and rear cameras, 4″ screen, DLNA support and Android 2.3, it’s actually on par with most of the LTE phones on the market. In fact, other than the Bionic, it’ll be the only phone running Gingerbread – yikes. You can download the user manual for it below.